We exclusively reported about a month ago that Samsung has started working on the Android 7.0 Nougat update for the Galaxy A (2016) series. Australian carrier Optus started testing this update for the Galaxy A5 (2016) just a few weeks ago. Samsung is also testing said update for the Galaxy A5 (2016) and the Galaxy A3 (2016). 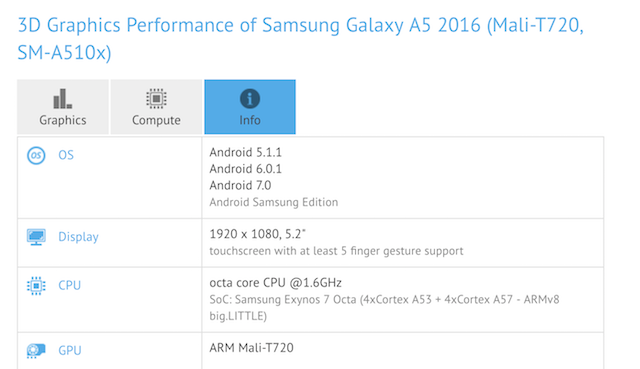 Both handsets have been spotted on GFXBench running Android 7.0 Nougat. It’s a good sign that Samsung has started testing the Nougat update for these devices. Those who own one should hold on to hope that the company will release Nougat for the Galaxy A (2016) fairly early in 2017. It goes without saying that this series will only get Nougat after Samsung has released it for its flagship devices. Samsung recently said that it’s going to try and release Nougat to the public for the Galaxy S7 and Galaxy S7 edge by the end of January. There’s good reason to believe now that the Galaxy A (2016) series will receive said update soon after the flagships are taken care of. Models mentioned are 310 & 510 which are launched for this region more over what about A7100? as i own one but its still running Android 5.1.1 and there is no Marshmallow update for it yet..! Android 6.0 or 7.0 update please update.. If the Update to Nougat brings better perfomance for A5 (2016) thats would be good! I bought a new one 2 days ago and crying my money. Full lags and crashes on Play Store and Chrome after the January Update! From my use on the galaxy a5 2016 currently running marshmallow. Ive seen that there has been some animation lag and game performance decrease from lollipop. Also loading basic apps such as setting takes slightly longer that lolipop. If samsung could fix these issues without reducing performance that would be the dream. However marshmallow is still a very stable os compared to others. I think they forgot last year’s flagships s7&s7 edge. I’m owner of s7, when i will receive update, samsung? From above article it looks that samsung owing to drop in its market share in India is focusing to regain its share by giving android updates to its specific devices. Models mentioned are 310 & 510 which are launched for this region moreover what about A7100? as i own one but its still running Android 5.1.1 and there is no Marshmallow update for it yet. Wrong! Optus was testing the nougat update for the 2014 A5. The 2015 generation was never sold in Australia and Optus will never ever be able to push firmware to any imported taiwanese csc units. Go look for yourself, no australian csc for the 2015 model in kies server. When nougat for s7 edge?